"Spirit of Rett" breaks 45-year old goldenrod record! On September 21, 2010 the “Spirit of Rett” made two phenomenal speed runs. 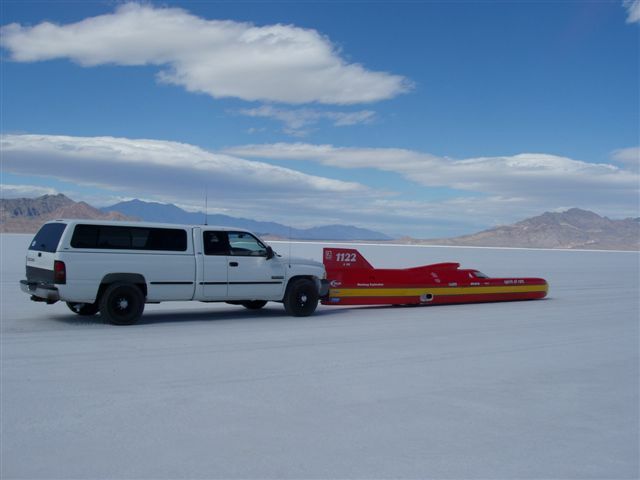 The first run averaged 417 MPH with an exit speed of 422.6. The return run, made under more difficult track conditions, averaged 411.7 MPH with a top speed of 417.65. The average speed of approximately 414.4 MPH exceeded the 45 year old Summers brothers’ Goldenrod record set when I was 15 years old. The “Spirit of Rett” now has the fastest single engine car record in history. The crew, led by Lee Ryan, consists of Roine Andersson, David Tate, Scott Sargent, Ed Stuck, Chuck Horrell, and Tom Brown. The engine, which performed absolutely to perfection, was built by Brad Morgan and Bruce Allen of Reher-Morrison Racing Engines. Our oil, which had to work under extreme temperatures, was provided by Red Line Oil Corporation. The parachutes and safety gear was provided by D-J Safety. Rick Cameron helped us throughout the year with engineering and fabrication as well as pit stop and turn around help during the record attempt. Bob Hansen did a fine job over the winter of lengthening the car for us by 3’, and Kebin Kinsley fabricated new body work for the lengthened car. A.J. Smith is our aerodynamicist and steered us in the right direction on the new nose for the car, which was put in final form and built by Richard Nauert and his excellent crew at Southwestern Performance Technology Corporation. I also want to give credit to Howard Nafzger who was the original designer of the car, and to Earl Wooden who made key improvements. I am extremely gratified for all the hard work of these individuals toward the “Spirit of Rett” effort. Over the last 45 years many people, many times have attempted to break the record, and we are very proud and humbled to have finally done so. I am sincerely humbled and grateful for all the kind words and congratulations you have sent to me and the team. I am slowly but steadily responding to each of these individually and I thank you all for your prayers and well wishes. This effort is dedicated to Rett and all the children fighting cancer. 3. First and only unblown single engine car over 400 MPH! 4. First and only car to ever set two over 300 MPH records in one day! 6. First and only car to ever hold the two fastest unblown FIA records at the same time! 7. 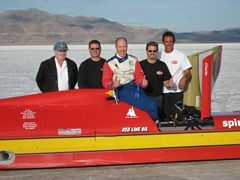 At the 2011 FIA Landspeed Shootout held in September, the “Spirit of Rett” increased its FIA Category A, Group II, Class 10 record to 366.59 MPH. as a point of reference in the following videos, the orange markers are 1 mile apart while the black flags indicate the half miles!